The Square Kilometre Array (SKA) is a next-generation radio telescope that will ultimately have a square kilometre of collecting area, making it the most sensitive radio telescope in the world. The project to design and build the SKA is an international collaboration, involving 20 countries. Site selection was decided in 2012; with one site in Australia, another in South Africa and headquarters in the United Kingdom. • SKA1-Low will operate between 50 and 350 Megahertz and consist of 130,000 antennas with baselines up to 40 km (possibly extended to 65 km). • The telescope will be located at CSIRO’s Murchison Radio-astronomy Observatory in Western Australia (350km east of Geraldton) in a designated radio-quiet zone. • CSIRO acknowledges the Wajarri Yamaji as the traditional owners of the MRO site and an Indigenous Land Use Agreement has been negotiated with them. • SKA1-Mid will consist of 130 parabolic dish antennas, with a maximum baseline of 120 km and operate between 350 Megahertz and about 15 Gigahertz. • The first 64 dishes are 13.5 metres in diameter and used for the pathfinder telescope MeerKAT and the remainder will be 15 m in diameter. • SKA1-Low will process data at a rate of about 157 Terabytes per second, which is enough to fill 27 million laptops with data every day and is about 5 times the estimated global internet traffic in 2015. • SKA1-Mid will process data at a rate of about 2 terabytes per second, enough to fill 340,000 laptops with data every day. • Processing these data rates requires dedicated high performance computing facilities. SKA is an international organisation consisting of 12 Member countries, with headquarters at the Jodrell Bank Observatory, near Manchester in the United Kingdom. Member countries include Australia, Canada, China, India, Italy, New Zealand, South Africa, Sweden, the Netherlands and the United Kingdom. Further countries have expressed their interest in joining the SKA Organisation, which will continue to expand. SKA is in the process of being formally established as an Intergovernmental Organisation (IGO), with final ratification expected to be announced later this year. On Friday 25 May 2018, it was announced that negotiations to agree the international treaty establishing the Square Kilometre Array (SKA) Observatory had concluded, making way for founding members of the new IGO to sign the treaty. The next step for member countries is to sign the treaty (SKA Convention) to establish the SKA Observatory. Precursor telescopes like the South African MeerKAT and HERA, along with the Murchison Widefield Array (MWA) and CSIRO’s Australian SKA Pathfinder (ASKAP) are providing SKA scientists with invaluable knowledge to assist in the design of the SKA’s main telescopes over the coming decade. Located at future SKA sites, these precursors are carrying out scientific study related to future SKA activities, as well as helping the development and testing of new crucial SKA technologies. The SKA project is currently in its design and development phase, known as pre-construction. Companies, science and reserach organisations from 20 countries are working together across 9 international consortia to perfect the design. This year, all of the consortia are working towards Critical Design Reviews (CDRs) – which is an approval process by external experts of each for each of the elements. CDR which will be followed by a system-level CDR in late 2018. The next stage is a construction proposal which will be put to the future SKA Council in 2019, for approval towards the end of that year. Planning suggests it will take 7 years to construct SKA. Responsible for the design of the antennas and local processing for SKA1 Low, this consortium is led by ASTRON in the Netherlands. It includes development and deployment of the Aperture Array Verification System 1, which is testing the SKA station design and construction techniques. LFAA has built a prototype at the MRO. In an important engineering milestone, a full station of 256 low-frequency antennas has been deployed and is undergoing tests at the MRO. The demonstrator, known as the Aperture Array Verification System (AAVS1) is being used to help test and finalise the design of the low frequency antennas for SKA 1-low. Read more. The Dish Consortium is responsible for the design and verification of the antenna structure, optics, feed suites, receivers, and all supporting systems and infrastructure for SKA1 Mid. The Dish consortium is currently led by JLRAT. This consortium works on both SKA1 Mid and SKA1 Low, designing the digital processing hardware and firmware for the generation of visibilities, pulsar survey candidates and pulsar timing. The consortium is led by the National Research Council of Canada. This consortium is designing the hardware and software to control the two telescopes. This includes the software for scheduling telescope observing and the monitoring of telescope performance. The Telescope Manager consortium is led by the National Centre for Radio Astrophysics in India. Each of the host countries leads an infrastructure consortium, responsible for designing the infrastructure to be deployed. This includes roads, buildings, power generation and distribution, reticulation and vehicles. CSIRO’s Ant Schinckel, leads this consortia in Australia. Led by the University of Manchester in the UK, this consortium is responsible for designing the software and hardware to transport SKA data: from the telescopes to the central signal processing, to the high-performance computers (in Perth and Cape Town), and to the international network of SKA Regional Centres. It also includes high precision synchronisation and timing, which provides frequency and clock signals. Led by SKA South Africa and with CSIRO as the Australian partner, this consortium leads planning for the integration of the telescope components into a working system and deployment to the two sites. It is also responsible for the integration of the MeerKAT dishes into SKA1 Mid. This consortium is designing the computing hardware, software, and algorithms to process science data from the telescopes. The enormous data rates from the instruments mean that processing must occur in near real time: it is not possible to store the raw data for more than a few days. The consortium is led by the University of Cambridge. CSIRO’s Juan Carlos Guzman (amongst others) is a member of this consortia. Because of the scale and technological ambition of the project, many of the SKA’s component parts are being designed from scratch, driving technological advances and innovation in a range of fields. • Mid-frequency Aperture Array (MFAA). This consortium aims to prove the technological maturity of mid-frequency aperture array technology, and to evaluate different concepts of front-end technology that can serve to assist in the preliminary design of the MFAA. • Wideband Single Pixel Feed consortium. Led by Chalmers University in Sweden, this consortium is developing a broad spectrum single pixel feed for the SKA and seeks to greatly expand the frequency range covered by radio astronomy receiver systems. • Phased Array Feed (PAF). The PAF consortium, led by CSIRO in Australia, is developing wide field technology that can be used to significantly increase the survey speed of SKA. This work builds on PAFs currently developed for AKSAP and other instruments. As part of its operations, the SKA will establish an Observatory Development Programme (ODP). An extension of the current Advanced Instrumentation Programme, the ODP aims to ensure that the SKA, which is heavily reliant upon state-of-the art systems throughout the signal chain and needs continually improving algorithms, has a vibrant, affordable and realisable development programme for upgrades to SKA1 and in preparation for SKA2. The ODP will be funded by SKAO, with a proposed annual budget of €20m and co-funding provided by the partners. Technical work will mainly take place in member states, with technology options for development identified through expressions of interest. SKA1 construction is likely to begin around mid-2020 and the Australian SKA Office is working internationally to develop the procurement model for the project. Australia’s voting member of the SKA board sits within the Australian Department of Industry, Innovation and Science (DIIS). 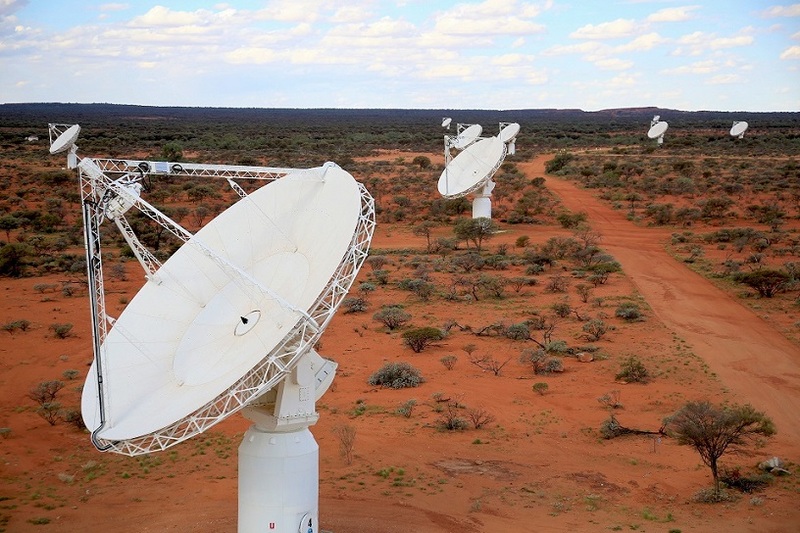 Australia’s involvement in the SKA project is coordinated by the Australian SKA Office, DIIS. • Curtin University is delivering the on-site testing and verification program for the Low Frequency Aperture Array, designing specialised infrastructure and processing systems and planning the deployment and commissioning of the LFAA antennas. • CSIRO and its industry partner Aurecon Australia are the main partners in the Infrastructure Australia consortium, designing critical site infrastructure, including RFI (radio frequency interference) shielded buildings, and power distribution and access, for the SKA1 Low telescope. And see more information below about CSIRO's extensive involvement in the SKA. • The University of Western Australia and CSIRO are contributing to the design and verification of the Science Data Processing system for the SKA1 Low telescope, working with a range of industry partners. The system will be a highly efficient supercomputer, an order of magnitude more capable than current systems, able to ingest 3.1 Terabytes of raw data and process observations involving 50 Petabytes. • Swinburne University of Technology is designing the highly specialised hardware and software needed for the pulsar timing engine for the SKA1 Mid and SKA1 Low telescopes. • CSIRO’s Dr Grant Hampson leads an international team, involving ASTRON (The Netherlands) and Auckland University of Technology (New Zealand), to design the SKA Low telescope’s correlator and beamformer, nicknamed 'Perentie'. Perentie will be a highly specialised processor able to convert the deluge of data from the SKA1 Low's thousands of antennas into a stream of useful data for downstream processing. • CSIRO’s Dr Adam Macleod is leading the planning for the system level assembly, integration and verification (AIV) of the SKA1 Low telescope in Australia. The AIV plan will be a critical element in the successful integration of the highly complex sub-systems that make up SKA1 Low. • Australia’s research network provider AARNet Pty Ltd and CSIRO are working on design of the data transport networks for the SKA Observatory in Australia and conducting performance testing to ensure the Australian elements of the SKA are effectively networked to the rest of the world. The Site Entity in Australia will manage the Murchison Radio-astronomy Observatory and deliver those aspects of the site that are the responsibility of the host country. This includes: land management, infrastructure management, radio quiet advice, external stakeholder management and delivery of aspects of the Indigenous Land Use Agreement, for example around access to the site, recognition of the traditional owners of the land, employment opportunities and education. CSIRO currently plays this role for the MRO, and is expected to continue to do so during the SKA era. The SKA Observatory intends to appoint an SKA Operator in each of the host countries to carry out site and engineering operations. This will include activities such as maintenance, hardware and software engineering and performing observations. The SKA Observatory intends to establish offices in the host countries, staffed by IGO employees. In Australia, this office will be based in Perth and will perform science operations activities. This may include technical performance monitoring, calibration, and aspects of science data production, quality assurance, project support and software engineering. They will also be responsible for agreements with the SKA Operators, Science Processing Facilities and the interface with Site Entities. Science Processing Facilities in each host country will be appointed by the SKA Observatory, and will be responsible for operating the supercomputer and digital storage needed to run the initial processing of SKA data (the ‘pipeline’). SKAO envisage that the Pawsey Centre will take this role in Australia. The core €674m construction funding for SKA1 does not include the distribution of data to users, nor computational facilities to enable users to undertake further data analysis, both of which are necessary if the SKA is to deliver on its scientific promise. As with several other large-scale scientific instruments, these functions will be provided from regional funding rather than from project funds. The SKA Board has agreed on a model for SKA Regional Centres, which would see SKA members establish and fund centres to provide computer support for the astronomers in their country or region. • to provide a long-term science archive for SKA data products, and to provide local user support to their communities. An Australian SKA Regional Centre Working Group is defining the scope, opportunities and requirements for the Australian regional centre. In particular, the working group will explore opportunities to expand the Australian SKA Regional Centre activities to include collaboration with similar activities in China, New Zealand and the broader Asia-Pacific Region. The International Centre for Radio Astronomy Research (ICRAR) in Perth and the Shanghai Astronomical Observatory have initiated the ERIDANUS Project (Exascale Research Infrastructure for Data in Asian-Pacific astroNomy Using the SKA) in collaboration with CSIRO and others. This effort will form part of the collective work in the Asian-Pacific Region to establish SKA Regional Centres. CSIRO Astronomy and Space Science (CASS) staff are core contributors to the development of SKA1-Mid and SKA1-Low. For example, CASS is developing the MRO site infrastructure and designed, built and now operates Australia’s Square Kilometre Array Pathfinder (ASKAP) telescope. CASS participates in seven of the ten Design Consortia: AIV, CSP, INFRA AU, AIV, CSP and SaDT. The design consortia are international groups tasked with developing aspects of the end-to-end telescope design and the interfaces between the various components. Their costing estimates are critical to keeping the overall cost within the cost cap. Each consortium will be subject to a Critical Design Review before the project moves into the construction stage. Playing a key role in a number of SKA R&D consortia including (leading) 'Infrastructure-Australia', 'Assembly, Integration and Verification', Central Signal Processing (CSP), Science and Data Processing (SDP) and Signal and Data Transport and Telescope Manager. Opportunities for Australian industry involvement are anticipated across a range of fields from construction and antenna assembly through to high performance computing and software development. Even in post-construction, there will be opportunities for industry throughout the 50 year operational life of the instrument. The SKA is a global project, but it is expected to bring real benefits to the Mid West region including opportunities for local companies and communities – including Wajarri Yamaji people (the native title holders of the area where the SKA will be built). In 2015, the Australian Government announced $293.7 million under the National Innovation and Science Agenda (NISA) to support Australia's involvement in the SKA. This funding includes: grants to Australian organisations involved in the design of the telescope (pre-construction); costs of the Indigenous Land Use Agreement; Australia’s contribution to SKA operations and construction over 10 years; and funding for the site entity. SKA in Australia will include not only the astronomy outcomes but also broader impacts such as industry and international collaboration, engagement and support of regional and indigenous communities, spin-off technologies and educational benefits. The signing of the international SKA treaty or “SKA Convention” by a number of member countries. The treaty will then be ratified by each country, marking the establishment of the SKA as an Intergovernmental Organisation (or IGO). Note: the time required to ratify treaties varies between countries. It may take over a year for some nations to ratify the convention. Completion of the work of the international design consortia (through a critical design review) as the project moves into an SKA systems design review and the development of a detailed construction proposal prior to beginning construction in 2020.